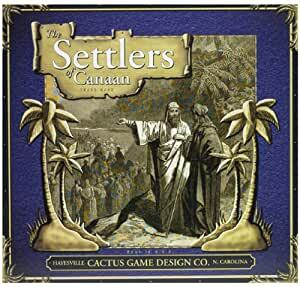 Settlers of Canaan Board Game. Decent game. A little long on instructions but good strategic game. Not sure how much it increases biblical knowledge but kids enjoy the theme regardless. My students LOVE this game. It is only loosely related to Bible history and mixes lots of time periods, so not of any educational value as far as history goes. Planning, strategy, and luck make the game fun. There are a LOT of rules and it has taken us MANY times of playing it before we can play without having to look up details. We all hate rolling a seven and having a plague. We added a few of our own rules to make play go a little faster - so we don't have multiple turns of not being able to do anything (just rolling the dice). My family and I thoroughly enjoyed this game. It differs from Settlers of Catan in a couple different ways. First the board is a fixed one piece ~ meaning you can not change the land or the resources or die numbers. I would prefer that they allowed you to change it up but they did very good on their placements. They also added a twist to the game with building of the Jerusalem Wall for another way to add points. they added a couple more twists in the rules and extra cards. We have both Canaan and Catan and give them both Five Star Family Fun. I bought this for a friend of mine who is a pastor and a huge fan of Settlers of Catan. Canaan is an okay game but it doesn't live up to the Settlers name in a myriad of ways. The build quality just isn't as good. You're not going to be getting the same sturdy game pieces that you would with literally any other Settlers game. The board (being a historical setting and all) is absolutely fixed. This greatly reduces the replayability of the game. A novelty at best. I don't think the friend I purchased this for has taken it out of the closet more than a handful of times. I got this game several years ago and have enjoyed playing it ever since I bought it. It's a Biblical theme of the original Settlers of Catan game, but the board is bigger and also fixed. The numbers are also fixed, but you can change that by creating your own movable numbers (or using the ones from the original Catan and then creating your own to make up for the ones your missing). If you enjoy strategy games or Settlers of Catan, I highly recommend this.